Manatees graze underwater in a local spring. Always watch out for manatees swimming in Florida’s rivers, bays, or coastal waters. Keep in mind this time of year manatees are searching for warmer waters to help them survive winter’s cold. With the onset of the manatee migration, the Florida Fish and Wildlife Conservation Commission (FWC) reminds people in boats and personal watercraft to slow down to avoid manatees, particularly in shallow areas. Many seasonal manatee protection zones go into effect beginning November 15 when the weather begins to cool. Adult manatees weigh about 1,000 pounds but can be difficult to see, especially when just below the water’s surface. Manatees are easier to spot if boaters wear polarized sunglasses and keep a lookout for signs of manatees such as the circular “footprints” they trace on the top of the water. Manatee numbers are up. “Boaters who slow down and keep a lookout for Florida manatees are an important reason the overall population of this species is doing better,” said Carol Knox, leader of the FWC’s Imperiled Species Management section. The FWC spends about $2 million each year on manatee conservation, including research, rescue, management and public education efforts, and works in partnership with agencies such as the U.S. 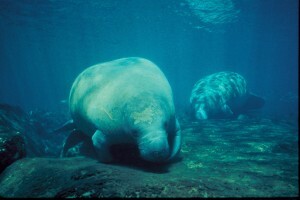 Fish and Wildlife Service on manatee issues. Floridians contribute to manatee conservation when they purchase the Save the Manatee license plate or donate $5 for the manatee decal. You can help manatees in many ways. Report sightings of injured, sick, or dead manatees to the FWC’s Wildlife Alert Hotline at 888-404-3922, #FWC and *FWC on a cell phone, or email Tip@MyFWC.com.